1 long red chilli, seeds removed. Stir the Japanese soy sauce, grated ginger, lime juice, rice wine and peanut oil together in a small bowl. Leave for an hour or so for the flavour’s to infuse. Trim away the white part of the spring onion and put aside for another use. Cut the green ends into about 5 cm lengths; using a very sharp knife, cut the spring onion into fine julienne. Add ice to a small bowl and half fill with cold water. Add the sliced spring onions to the bowl and leave a while until they curl up. To shred the chilli; Use a kitchen glove to handle the chili, slice into very fine slices. Stack the sliced chilli together and cut into very fine dice. Transfer to a small serving bowl. Clean any small pieces of shell away from the oyster, try and retain the natural oyster juices. Slide a small sharp knife under the flesh of the oyster to cut it away from the base of the shell. 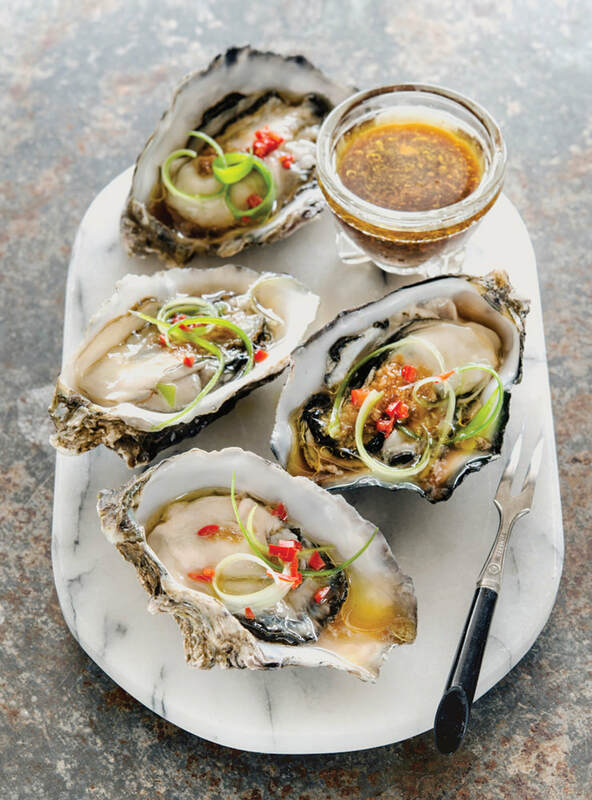 Drizzle a little Ponzu sauce onto each oyster, top with a few curls of spring onion and a sprinkle of chilli. The oysters can be dressed with the topping and left to sit a while in the fridge or on ice if ‘entertaining’ guests. Makes ¼ cup, enough to top 24 oysters. Tip: Oysters are an excellent source of zinc, iron and calcium and very rich in protein.